"This ring was a promotion item put out by the Kelloggs company that was tied into the the radio serials/shows of the day. The crusader ring was often tied into the radio story’s plot in one form of another. Over the years these have become more and more scarce simply with the passing of time but a good number are still out on the market. 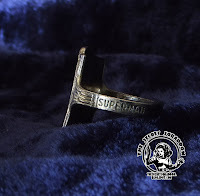 The Superman Crusader ring was made of tin with a “silver” finish. 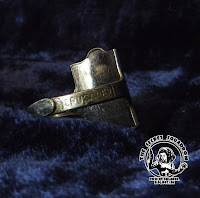 Collectors should please note that the crusader ring was produced with a simple “silver” finish which over time faded to a copper like tone as the finish wore off and faded. Some sketchy sellers have tried to pass off higher quality crusader rings as being made of actual silver. This is a no no. These rings were made for kids in the 1940s as a cheap company promo and were never cast in genuine silver. This ring was square in shape and had the words Superman and Crusader stamped into the ring shanks. Most of these rings found today may be slightly warped in shape as they were made of thin tin." -- from ComicBooked, "A Look at Superman's Rings"
The Superman Crusader ring was written into the Adventures of Superman radio show. In the episode Counterfeit Money that aired from 10-17-46 to 11-5-46, the Crusader ring is featured prominently in the episode. As a member of Superman's Crusader gang, the ring is a symbol of good citizenship, tolerance and good sportsmanship. The commercial for the Crusader ring offer premiered in episode eight of Counterfeit Money. 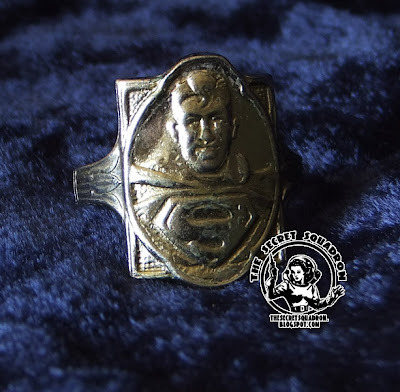 This is a "Superman Crusader" ring, still maintaining its silver coating and looks beautiful. It says "Superman" on one band and "Crusader" on the other, and it was a premium from Kellogg's in 1946. See also: The Superman PEP pin also from Kellogg's, also in the collection. This is not a shop. This is a private collection. Visit my collection of film props! Page design and background created and (c) 2012 by Nuno Miranda. Powered by Blogger.